Wire rope is several strands of metal wire twisted into a helix forming a composite "rope", in a pattern known as "laid rope". Larger diameter wire rope consists of multiple strands of such laid rope in a pattern known as "cable laid". Wilhelm Albert's first ropes consisted of three strands consisting of four wires each. In 1840, Scotsman Robert Stirling Newall improved the process further. In America wire rope was manufactured by John A. Roebling, starting in 1841  and forming the basis for his success in suspension bridge building. Roebling introduced a number of innovations in the design, materials and manufacture of wire rope. Ever with an ear to technology developments in mining and railroading, Josiah White and Erskine Hazard, principal owners of the Lehigh Coal & Navigation Company (LC&N Co.) — as they had with the first blast furnaces in the Lehigh Valley — built a Wire Rope factory in Mauch Chunk, Pennsylvania in 1848, which provided lift cables for the Ashley Planes project, then the back track planes of the Summit Hill & Mauch Chunk Railroad, improving its attractiveness as a premier tourism destination, and vastly improving the throughput of the coal capacity since return of cars dropped from nearly four hours to less than 20 minutes. The decades were witness to a burgeoning increase in deep shaft mining in both Europe and North America as surface mineral deposits were exhausted and miners had to chase layers along inclined layers. The era was early in railroad development and steam engines lacked sufficient tractive effort to climb steep slopes, so incline plane railways were common. This pushed development of cable hoists rapidly in the United States as surface deposits in the Anthracite Coal Region north and south dove deeper every year, and even the rich deposits in the Panther Creek Valley required LC&N Co. to drive their first shafts into lower slopes beginning Lansford and its Schuylkill County twin-town Coaldale. Stranded ropes are an assembly of several strands laid helically in one or more layers around a core. This core can be one of three types. The first is a fiber core, made up of synthetic material or natural fibers like sisal. Synthetic fibers are stronger and more uniform but cannot absorb much lubricant. Natural fibers can absorb up to 15% of their weight in lubricant and so protect the inner wires much better from corrosion than synthetic fibers do. Fiber cores are the most flexible and elastic, but have the downside of getting crushed easily. The second type, wire strand core, is made up of one additional strand of wire, and is typically used for suspension. The third type is independent wire rope core (IWRC), which is the most durable in all types of environments. Most types of stranded ropes only have one strand layer over the core (fibre core or steel core). The lay direction of the strands in the rope can be right (symbol Z) or left (symbol S) and the lay direction of the wires can be right (symbol z) or left (symbol s). This kind of rope is called ordinary lay rope if the lay direction of the wires in the outer strands is in the opposite direction to the lay of the outer strands themselves. If both the wires in the outer strands and the outer strands themselves have the same lay direction, the rope is called a lang lay rope (from Dutch langslag contrary to kruisslag, formerly Albert’s lay or langs lay). Regular lay means the individual wires were wrapped around the centers in one direction and the strands were wrapped around the core in the opposite direction. Multi-strand ropes are all more or less resistant to rotation and have at least two layers of strands laid helically around a centre. The direction of the outer strands is opposite to that of the underlying strand layers. Ropes with three strand layers can be nearly non-rotating. Ropes with two strand layers are mostly only low-rotating. Running ropes (stranded ropes) are bent over sheaves and drums. They are therefore stressed mainly by bending and secondly by tension. Track ropes (full locked ropes) have to act as rails for the rollers of cabins or other loads in aerial ropeways and cable cranes. In contrast to running ropes, track ropes do not take on the curvature of the rollers. Under the roller force, a so-called free bending radius of the rope occurs. This radius increases (and the bending stresses decrease) with the tensile force and decreases with the roller force. Wire rope slings (stranded ropes) are used to harness various kinds of goods. These slings are stressed by the tensile forces but first of all by bending stresses when bent over the more or less sharp edges of the goods. Donandt force (yielding tensile force for a given bending diameter ratio D/d) - strict limit. The nominal rope tensile force S must be smaller than the Donandt force SD1. Optimal rope diameter with the max. rope endurance for a given sheave diameter D and tensile rope force S - For economic reasons the rope diameter should be near to but smaller than the optimal rope diameter d ≤ dopt. The wire ropes are stressed by fluctuating forces, by wear, by corrosion and in seldom cases by extreme forces. The rope life is finite and the safety is only ensured by inspection for the detection of wire breaks on a reference rope length, of cross-section loss, as well as other failures so that the wire rope can be replaced before a dangerous situation occurs. Installations should be designed to facilitate the inspection of the wire ropes. Lifting installations for passenger transportation require that a combination of several methods should be used to prevent a car from plunging downwards. 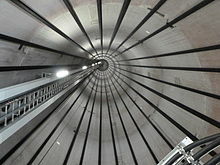 Elevators must have redundant bearing ropes and a safety gear. Ropeways and mine hoistings must be permanently supervised by a responsible manager and the rope must be inspected by a magnetic method capable of detecting inner wire breaks. When the wire rope is terminated with a loop, there is a risk that it will bend too tightly, especially when the loop is connected to a device that concentrates the load on a relatively small area. A thimble can be installed inside the loop to preserve the natural shape of the loop, and protect the cable from pinching and abrading on the inside of the loop. The use of thimbles in loops is industry best practice. The thimble prevents the load from coming into direct contact with the wires. A wire rope clamp, also called a clip, is used to fix the loose end of the loop back to the wire rope. It usually consists of a U-shaped bolt, a forged saddle, and two nuts. The two layers of wire rope are placed in the U-bolt. The saddle is then fitted over the ropes on to the bolt (the saddle includes two holes to fit to the u-bolt). The nuts secure the arrangement in place. Three or more clamps are usually used to terminate a wire rope. As many as eight may be needed for a 2 in (50.8 mm) diameter rope. There is an old adage; be sure not to "saddle a dead horse". This means that when installing clamps, the saddle portion of the clamp assembly is placed on the load-bearing or "live" side, not on the non-load-bearing or "dead" side of the cable. According to the US Navy Manual S9086-UU-STM-010, Chapter 613R3, Wire and Fiber rope and Rigging, "This is to protect the live or stress-bearing end of the rope against crushing and abuse. The flat bearing seat and extended prongs of the body (saddle) are designed to protect the rope and are always placed against the live end." The US Navy and most regulatory bodies do not recommend the use of such clips as permanent terminations. The ends of individual strands of this eye splice used aboard a cargo ship are served with natural fiber cord after the splicing is complete. This helps protect seaman's hands when handling. An eye splice may be used to terminate the loose end of a wire rope when forming a loop. The strands of the end of a wire rope are unwound a certain distance. The wire is then bent around so that the end of the unwrapped length forms an eye and the unwrapped strands are then plaited back into the wire rope, forming the loop, or an eye, called an eye splice. A Flemish eye, or Dutch Splice, involves un wrapping three strands (the strands need to be next to each other, not alternates) of the wire and keeping them off to one side. The remaining strands are bent around, until the end of the wire meets the "V" where the unwrapping finished, to form the eye. The strands kept to one side are now re-wrapped by wrapping from the end of the wire back to the V of the eye. These strands are effectively rewrapped along the wire in the opposite direction to their original lay. 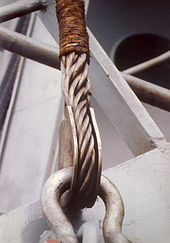 When this type of rope splice is used specifically on wire rope, it is called a "Molly Hogan", and, by some, a "Dutch" eye instead of a "Flemish" eye. Swaging is a method of wire rope termination that refers to the installation technique. The purpose of swaging wire rope fittings is to connect two wire rope ends together, or to otherwise terminate one end of wire rope to something else. A mechanical or hydraulic swager is used to compress and deform the fitting, creating a permanent connection. There are many types of swaged fittings. Threaded Studs, Ferrules, Sockets, and Sleeves are a few examples. Swaging ropes with fibre cores is not recommended. Poured sockets are used to make a high strength, permanent termination; they are created by inserting the wire rope into the narrow end of a conical cavity which is oriented in-line with the intended direction of strain. The individual wires are splayed out inside the cone or 'capel', and the cone is then filled with molten lead-antimony-tin (Pb80Sb15Sn5) solder or 'white metal capping', zinc, or now more commonly, an unsaturated polyester resin compound. ^ a b "FAQ | Lexco Cable". www.lexcocable.com. Archived from the original on 2017-01-04. Retrieved 2017-01-04. ^ "Wilhelm Albert". Encyclopædia Britannica. Archived from the original on 9 April 2014. Retrieved 9 April 2014. ^ Koetsier,Teun; Ceccarelli, Marc (2012). Explorations in the History of Machines and Mechanisms. Springer Publishing. p. 388. Archived from the original on 31 March 2017. Retrieved 9 April 2014. ^ Donald Sayenga. "Modern History of Wire Rope". History of the Atlantic Cable & Submarine Telegraphy (atlantic-cable.com). Archived from the original on 3 February 2014. Retrieved 9 April 2014. ^ Fred Brenckman, Official Commonwealth Historian (1884). HISTORY OF CARBON COUNTY PENNSYLVANIA (2nd (1913) archive.org, ed.). Also Containing a Separate Account of the Several Boroughs and Townships in the County, J. Nungesser, Harrisburg, PA, project 1913 edition, pdf e-reprint). p. 627. ^ "Wire Rope Safety Training". Falck Productions. Archived from the original on 19 January 2015. Retrieved 27 June 2012. ^ Avallone, Eugene; Baumesiter III, Theodore (1978). Marks' Standard Handbook for Mechanical Engineers (Ninth ed.). pp. 10–34. ISBN 0-07-004127-X. ^ T R Barnard (1959). "Winding Ropes and Guide Ropes". Mechanical Engineering. Coal Mining Series (2nd ed.). London: Virtue. pp. 374–375. ^ "Socketfast® Resin Compound". ESCO Corporation. 2015. Archived from the original on 2016-04-21. ^ "Socket-Lock". 2011. Archived from the original on 2016-04-16. This page was last edited on 22 February 2019, at 20:52 (UTC).